Mark my words, there are going to be more giant bucks killed in Illinois this season than we have seen for many years. This might even be the year that Mel Johnson’s world record archery typical is dethroned, although it might not be an Illinois buck that does it. There is good reason for my optimism. This summer I have manned nearly 50 trail cameras in 5 central Illinois counties. I have had those cameras on 30 different properties since early July. I have never seen the number of bucks over 150” that I have this summer. In fact I have never seen as many bucks over 170” as I have this year. Besides my own photos, I have been privileged to see a number of giants captured on trail cameras by other hunters also. I have confirmed two bucks within my hunting areas that will gross over 200”. Neither buck is on property that I own or lease so they will be very tough to kill. 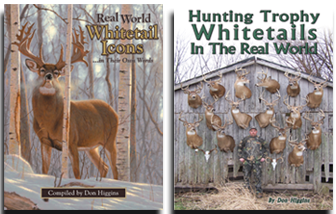 One of these bucks is more than an hour from my home and I will have to contend with a lot of hunting pressure to get a crack at either buck. Still, just knowing that a buck of this caliber is in an area you are hunting makes it a lot easier to get out of bed on cold November mornings. I am going to keep photos of the better bucks I have located this summer to myself for now as I have been made aware the some local hunters seem to be using my website and Facebook page as a scouting tool. I understand its part of the price to pay for the extraordinary success I had last season. Although I openly shared photos of last year’s bucks long before I shot either of them, a few things have happened that will have me holding my cards a little tighter to my chest. I am going to share some photos of some of the nicer “up and comers” that I hope survive the coming hunting season and are still around when I put my cameras back out next summer. So here they are. I have always wanted to kill a Booner on public land and this heavy-horned 5×5 may fit the bill next year. He already looks really good in this photo taken in early July when he still had some growing to do. Note – the date on the photo is wrong, it is actually July 8, not August 7. I have always wanted to kill a drop tine buck but in all of my years I have only seen 2 of them. Both were on the same property the same year about 20 years ago. This summer I have photos of 3 different bucks with drop tines. This 2 yr old will need several more years to make it to my hit-list but he will be a buck I will be looking for next summer. This drop tined buck is either a 3 yr old or maybe a 4 yr old. Either way, I hope he survives a couple more years at least. The photo on the left is from 2017 and the one on the right from this summer. I am fairly confident it is the same buck based on the fact that the photos are from the same area and both bucks are part of the same bachelor group. The only other buck I ever saw make this big a jump in antler size from 2 yrs old to 3 yrs old was Smokey, the 206 6/8″ buck I shot last season. I can only dream of what this 6×6 buck will look like in 3 more years. I have a lot of history with this 5 1/2 year old buck including his last 2 sets of shed antlers. I am guessing this heavy horned bruiser will end up gross scoring within a couple of inches of 170″. I have no doubt I could get this buck on the ground but with much bigger bucks to chase I wont be focusing on this buck at all. This unique unicorn buck is still a youngster that I sure hope survives as he will make a very unique trophy in another 2-3 years. Here is another buck that might make my dream of killing a public land giant come true one day. There is a very interesting story behind this photo; I set out early one morning in July to set this brand new camera and when I checked it 6 weeks later this was the very first photo the camera ever took. This photo was taken at mid-day and as you can see the buck is running past the camera. Even at a run this buck smelled my scent from earlier that day and turned around and came back to check things out. I ended up getting a series of 24 excellent photos of this buck from every angle. This is definitely an older buck that could make the hit list as early as the 2019 season. This youngster is just 2 years old but he has the makings of giant. He has to beat some pretty long odds but if he can make it to 2022 I will be all over him and by then I will have enough history to be in a good position to succeed. I’ve got more photos of bucks of this caliber than I can keep track of. This is one of those bucks that I hope somebody shoots. His short brows and G-2s will prevent him from ever scoring very well. As a 3 yr old he will be a tough buck to kill if someone doesn’t get him this season when he will still be very vulnerable. These final photos are just some that I randomly selected from the over 300,000 trail camera photos I have gotten this summer. Now that bucks are shedding velvet, bachelor groups are breaking up and crops are being harvested, some bucks will be shifting to their fall range. I know of at least 4 potential target bucks that I do not yet have photos of because they do not summer on the properties where I hunt and have cameras. I am anxiously looking forward to see what these bucks have grown for racks n 2018 and also seeing what other bucks show up on my cameras in the weeks leading up to the rut.